The European Innovations Pavilion is more than a place of exhibition; it is an active place of new business and new connections. It is where European partners come together under one umbrella of European innovations. 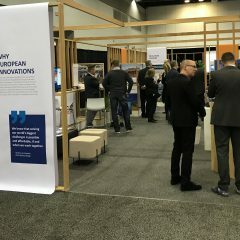 We have hosted the European Innovation Pavilion at Buildex Vancouver since 2018. Buildex is the biggest construction and building conference and trade shows in Western Canada. As an innovations partner, World of Walas has been awarded a prime section on the tradeshow floor, total square footage of 1400 sq. ft (130 sq. m) to connect European knowledge and tools to local partners and local demand. We annually select 12-15 partners to be part of our group. By being part of a larger whole, we strengthen each others’ message, help each other on the trade show floor and garner greatest interest from attendees. We offer opportunities to make useful introductions by carefully connecting European businesses to our local network. In 2019, we expanded our offering to include a full 5-day trade mission. This gave our partners an opportunity to explore the Vancouver market through targeted meetings and site visits, and to network and connect with local decision makers.